Challenges are fun! From silly, to serious, they captivate us. They give us a sense of being “in it together” with family, friends and soon-to-be-friends. 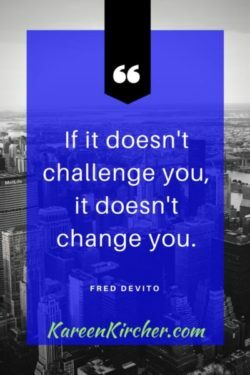 Here are 5 ways a challenge can change your outlook for the better. We all lead “busy” lives. But even truly busy people challenge themselves to prioritize. When you have to commit to something new, you have to look at your schedule with a critical eye, and decide what to get rid of. The by-product is that even after the challenge is gone, you can look back to a time that you made a decision to walk away from something that held you back. The beauty of technology is that it has built-in accountability. Besides the folks in my challenge group, we had to select a couple of people outside the group. It has the dual benefit of having what I call an “external conscience,” and also a group of people to high-five your accomplishments. By seeing others strive to reach the same goals, you get inspired, even as you compete. When someone who has mastered something does it, it looks easy. That’s the case when I “easily” debug a problem for a consulting client. That’s definitely the case when I watch Bryant, our challenge coach, demonstrate the proper form and the execution of our challenge for a particular day. For something that lasts only 30 seconds at a time, you can certainly work up a sweat faster than you imagine. Through all the hard breathing that remind me of my lack of physical fitness, emerged a sense of accomplishment. The duration of a challenge doesn’t actually matter, but how closely you comply does. What about you? What challenges have you done, or can you join, to jumpstart some good habits in your life? If you decide to sign up for the next free challenge with Bryant, tell him Kareen sent you!